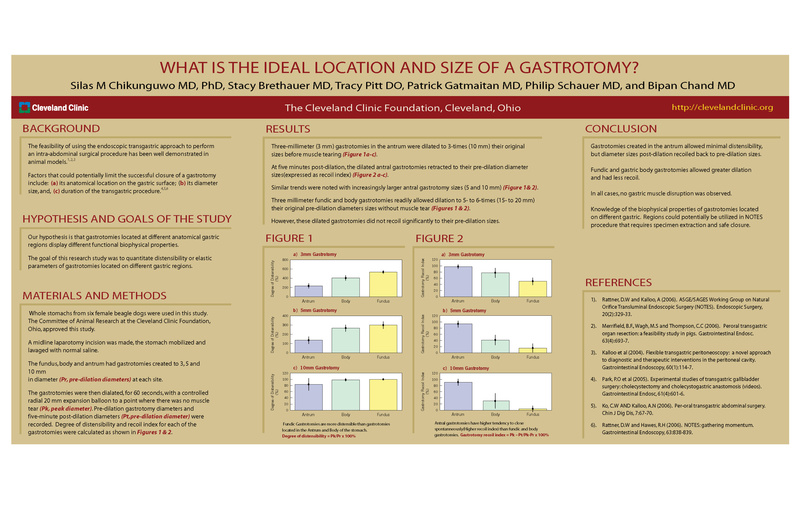 What Is the Ideal Location and Size of a Gastrotomy? The feasibility of using the endoscopic transgastric approach to perform an intra-abdominal surgical procedure has been well demonstrated in animal models. Factors that could possibly limit the successful closure of a gastrotomy include: (a). its anatomical location on the gastric surface; (b). its diameter size, and, (c). duration of the transgastric procedure. Our hypothesis is that gastrotomies located at different anatomical gastric regions display different functional biophysical properties. The goal of this research study was to quantitate distensibility or elastic parameters of gastrotomies located on different gastric regions. Whole stomachs from six female beagle dogs were used in this study. The Committee of Animal Research at the Cleveland Clinic Foundation, Ohio, approved this study. A midline laparotomy incision was made, the stomach mobilized and lavaged with normal saline. The fundus, body and antrum had gastrotomies created to 3, 5 and 10 mm in diameter at each site. These gastric perforations were then dialated, for 60 seconds, with a controlled radial 20 mm expansion balloon to a point where there was no muscle tear. Pre-dilation gastrotomy diameters and five-minute post-dilation diameters were recorded. Three-millimeter (3 mm) gastrotomies in the antrum were dilated to 3-times (10 mm) their original sizes before muscle tearing. At five minutes post-dilation, the dilated antral gastrotomies retracted to their pre-dilation diameter sizes. Similar trends were noted with increasingsly larger antral gastrotomy sizes (5 and 10 mm). Three millimeter fundic and body gastrotomies readily allowed dilation to 5- to 6-times (15- to 20 mm) their original pre-dilation diameters sizes without muscle tear. However, these dilated gastrotomies did not recoil to their pre-dilation sizes. Gastrotomies created in the antrum allowed minimal distensibility, but diameter sizes post-dilation recoiled back to pre-dilation sizes. Fundic and gastric body gastrotomies allowed greater dilation and had less recoil. More pressure was needed to maximally distend antral gastrotomies than those of the fundus and gastric body. In all cases, no gastric muscle disruption was observed. Knowledge of the biophysical properties of gastrotomies located on different gastric regions could potentially be utilized to strategically create gastrotomies for performing specific transgastric procedures.